Everyone knows two things about the future of transportation – all vehicles will be electric and fully autonomous. Major car manufacturers are making steps towards that direction – some cars already have advanced self-driving systems. But what about trucks? Volvo and Mercedes-Benz are testing two very interesting applications for autonomous trucks. Obviously, in the future most trucks are going to be self-driving. And it is for the better – goods will be transported more efficiently, environment is going to be damaged a little less and roads will be just that little bit safer. However, we don’t have this technology available now, but Volvo and Mercedes is seeing opportunities to improve working conditions of the drivers using advanced autonomous tech. 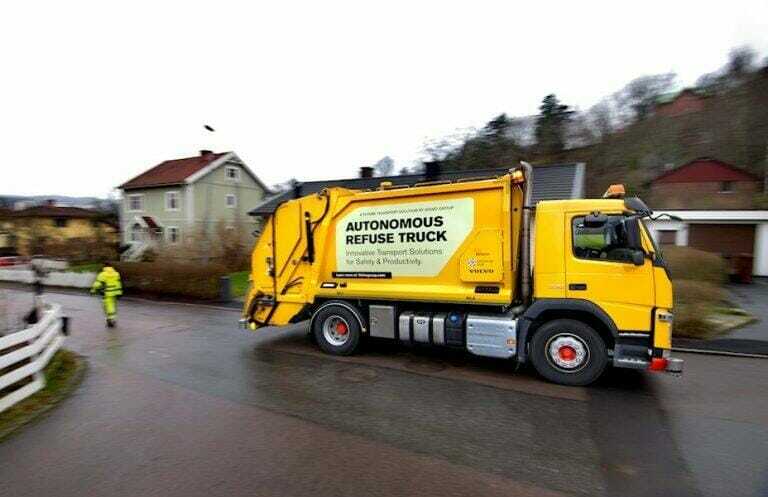 For example, Volvo is testing autonomous refuse handling trucks in Sweden. However, they do not always drive themselves. In fact, the first visit in the new area is to train the system. Various radars and sensors, situated around the refuse truck, scan the new area and computer memorizes the route. When the truck comes to the same place for the second time, the driver just steps out of the truck by the first house and goes to deal with the garbage containers. The truck will then proceed to reverse to other houses where containers need to be emptied. The driver will simply walk in front of the truck the whole time, ensuring that the system is not going to cause an accident. Volvo Trucks says that autonomous refuse trucks like this will save time and prevent workplace injuries. Drivers will not have to climb in and out of the truck all the time, which will make their job a little easier. Meanwhile, trucks will be able to drive around parked cars and will even avoid unexpected obstacles. If something does happen out of the ordinary, the driver can always use the exterior-mounted panel to stop the autonomous operation. The system is already being tested in Sweden and seems to work very well. Refuse handling trucks should be autonomous. Now drivers struggle to manoeuvre through tiny streets, usually filled with parked cars. If they want to reverse safely, they need a second worker to go behind them and give directions. And then there is that exhausting climbing in and out of the truck by every house. Meanwhile Daimler is seeing another area where autonomous trucks could bring substantial benefits – clearing snow from runways. 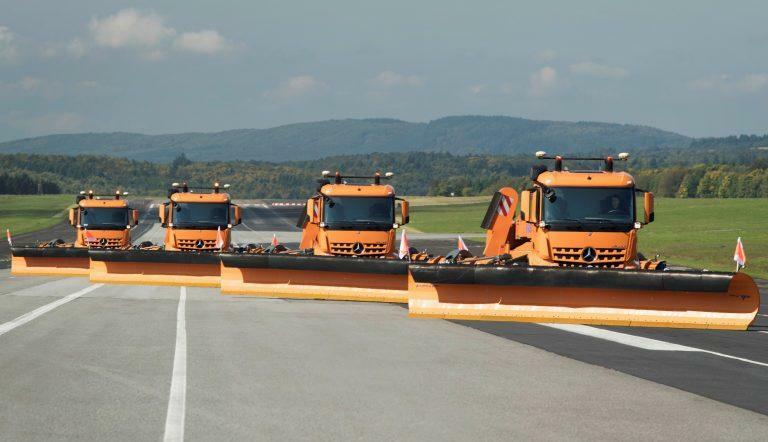 Every winter causes trouble in many airports and snow has to be cleared often. This causes delays and even cancelled flights. When weather is unpredictable, truck drivers have to stay waiting for the call, which sometimes doesn’t come. On other occasions they are so busy that they simply cannot keep up with the snow. Solution – an autonomous convoy. Mercedes already tested 4 Arocs trucks convoy. These snow clearing trucks were equipped with Remote Truck Interface technology. This means that only one driver is needed to control the entire convoy. He drives one of the trucks (all of them are the same) and other ones follow. He can adjust their path in the screen in his cabin. Mercedes says that this works much faster than the current methods, especially if you expand the convoy – there could be up to 14 trucks controlled by a single driver. GPS and a number of different sensors ensure that trucks maintain the proper line. This is very important, because now human driver commonly damage runway lights and markings – it is unavoidable in blizzard conditions with very poor visibility. It is obvious that it would be much quicker and more effective without human drivers, because computers always make trucks follow the most efficient line and maintain a proper distance from the truck driving in front. The operator could also engage attachments from his own cabin and adjust each truck individually. The same technology could be employed in other areas too. But what truck drivers will think about these advancements? It seems like autonomous vehicles are ready to take over many fields at any moment, but it is unlikely that drivers will start losing their jobs in favour of autonomous technology any time soon – their expertise will remain needed for a long time.